Avid campers often invest in their own RVs in order to take weekend outings to the next level. These homes-on-wheels have the ability to make camping a luxurious experience and bring families closer together. However, owning a camper does come with its share of difficulties—like finding enough room for something of that size at home. Fortunately, self storage facilities across the country provide outdoor RV storage for those who want to free up some driveway space and still have easy access to their recreational vehicles. There are many great reasons for using self storage for your RV. Not only is RV storage an affordable and convenient option, it has many other benefits as well. 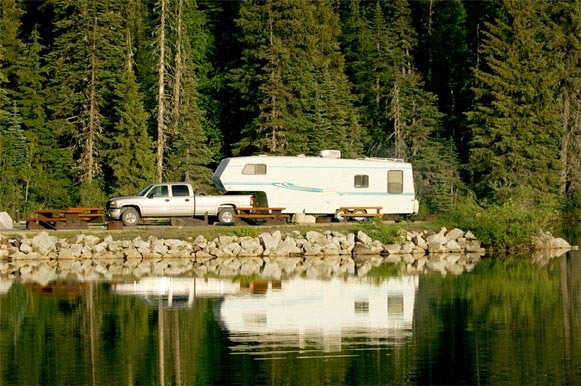 RVs come in a wide range of sizes, varying from 5th wheels trailers to actual motorhomes. The largest, the Class A motorhome, can average between 25 to 40 feet long. The large size of most campers can easily take up an entire driveway or cause problems with home storage. Using RV or trailer storage allows you to take back some of that space. A lot of neighborhoods have specific covenants that prohibit the parking of RVs or trailers on driveways for long periods of time. There are even rules against parking one along the side of your home in some neighborhoods. Camper storage allows you to follow these rules and still own the camping vehicle of your dreams. It can be dangerous to leave an RV or trailer in front of your house, as they’re often magnets for vandalism and theft. Using RV storage can provide an added level of security for your favorite camper. Storage facilities often have high fences, gated access, and even video surveillance. With so many storage facilities spread throughout the nation, you can easily find a location that’s convenient for you. Whether that means it’s close to your home or closer to the highway, you can choose a storage facility that makes hitting the open road easier than ever. Class A – If you have a Class A motorhome, you’ll need a fairly large parking spot or storage unit to store your RV. The amount of space required could be up to 40 feet long to accommodate the largest of Class A motorhomes. In order to store one indoors, it would likely have to be at a special RV storage facility. Class B – Class B motorhome owners won’t need as large of a parking spot or unit as those with Class A motorhomes. A Class B motorhome can be up to 17 or 19 feet long, so you’ll need at least that much space for storage. Class C – Class C motorhomes are also fairly long so you’ll need to be sure you have a space at least 30 feet in length to be able to store this type of RV. Usually, these will require a specialized facility for indoor storage as well. Most facilities cannot accommodate indoor RV storage unless they’re built for that specific purpose. RVs can be up to 13 feet, 6 inches in height, which isn’t available at a standard facility, so make sure you have proper clearance if you plan to store indoors. Another thing to consider is whether or not you want to protect your RV from the elements, which may be recommended in a region with harsh winters. While most facilities have outdoor RV storage, some may offer indoor or covered RV storage as well. Outdoor – Outdoor RV storage is the most common choice and the most affordable. If weather isn’t much of a concern in your area, Outdoor storage can be a great option for your RV. Covered – There are some storage facilities that offer covered storage for RVs and trailers. These provide additional protection from the elements, such as sun, hail, and snow. Indoor – Indoor RV storage is the most expensive option for storing your motorhomes or trailers, but it’s worth it in certain climates. If you experience heavy snowfall or severe storms in your region, protecting your RV with indoor storage will save you money on repairing damages. How much does RV storage cost? RV storage prices depend largely on location and amenities, such as sewage dump stations. Some facilities will have gravel lots while others will have a paved parking lot. Outdoor storage can start as low as $30 to $50 a month in some locations but could go as high as $60 to $100 or more. Cost will correlate with the size of your RV, so expect to pay more for a Class A motorhome than you would for a Class B or small trailer. Of course, indoor storage will always cost a bit more for the convenience. For unheated indoor storage, rates start around $50 to $125 or more. If you want to have your RV protected from the winter, heated RV storage can cost anywhere from $100 to $450 a month. Again, prices will correlate with the size of your RV, as well as dictated by amenities offered. Some facilities offer premium services, such as valet parking, battery charging, sewage dumping, and more, which will lead to higher rates but may be worth the investment. The convenience of doing everything at one place can be invaluable, and they can also increase the running life of your RV.